"Do you love colours, quilting and you're ready for a new challenge? You're at the right place. We're sure we can inspire you with our beautiful collection of colorful designs!" Jacqueline de Jonge. Fern Textiles now sells the be colourful fabrics & patterns. Please feel free to contact us if you need to place an order. 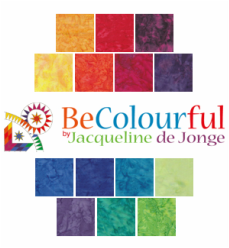 Be Colourful: A colour card with the 38 fabrics from Anthology Fabrics can be used to create the wonderful quilts using Jacqueline's patterns . These fabrics can be used for patterns of Aurora, Midnight Stars, Summer Dream, Enchanting Stars, Endless or Brilliant Beauties of Joy.